Live Your Life | The mission of Good Shepherd Center is to feed the hungry, shelter the homeless and foster transition to housing. 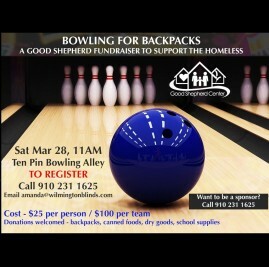 We invite bowlers of ALL ages to join us at the 3rd annual Bowling for Backpacks at Ten Pin Alley on Saturday March 28th! Contact Amanda at amanda@wilmingtonblinds.com or 231-1625 for more information and sponsorship opportunities. We hope to see you there!